Fill glass terrariums with air plants for a low-maintenance hanging garden. 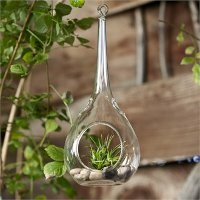 Hanging glass terrariums are everywhere these days, popping up in florists’ shops, homes and even on the web. These delicate glass ornaments are an attractive design element on their own or when decorated with small plants, sandy shells, or mosses, but when grouped and played against one another they can really make your living space chic. How can you add some stylish terrariums to your home? Here are some helpful tips. What can you use to fill your terrarium? Although you can fill hanging terrariums with just about anything, some elements are pretty common: plants, water, flowers, candles, rocks, shells, and tiny statues top the list of go-to fillers. Some of these things work better than others, if you’re planning on keeping your terrarium stocked for the long haul. 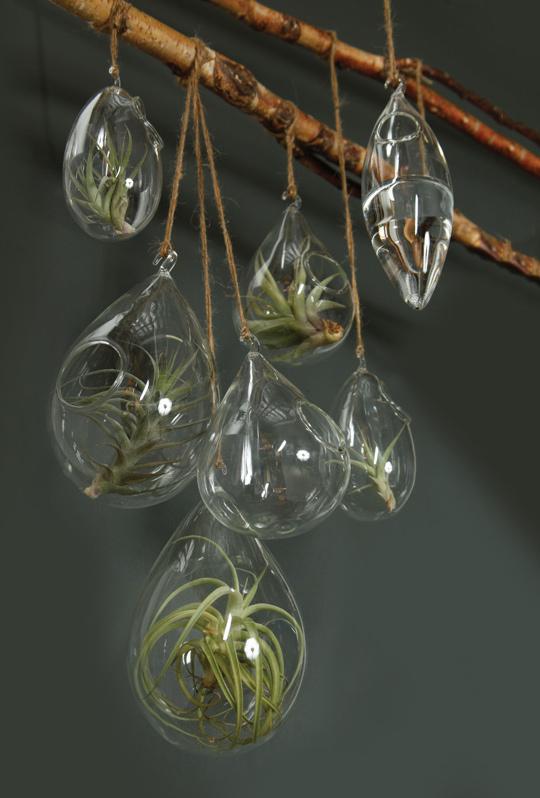 Plants: Air plants, members of the genus Tillandsia, are far and away the best plants for hanging terrariums. They require little care and are adapted to living in environments where deep rooting isn’t possible. These plants bloom in many colors, and best of all, many remain very small throughout their lives. Small aquatic plants and live mosses can be good choices if you remember to water them regularly. Colored sand, water and clean soil are common mediums for plants in globe terrariums. Candles: Use small glass globes to easily suspend candles in midair. Glass catches the light in lovely ways, and tea lights are always inexpensive. There’s no need to worry about wax dripping anywhere or a fire hazard (as long as you securely hang your terrarium globes). Other Decorations: If you opt out of live plants, the world is your oyster. You could fill your terrarium with dried mosses, pebbles, marbles or glass beads as a base for your soon-to-be original designs. 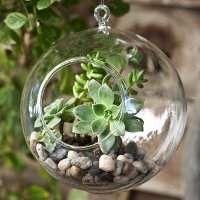 Rocks, dried plants, tiny statues, shells and glass sculptures do well in globe terrariums intended for long-term use because they can tolerate the humidity that may build inside these glass balls when plants are included in your design. Dry terrariums may benefit from the addition of preserved plant materials like lichens, dried flowers or seed pods. 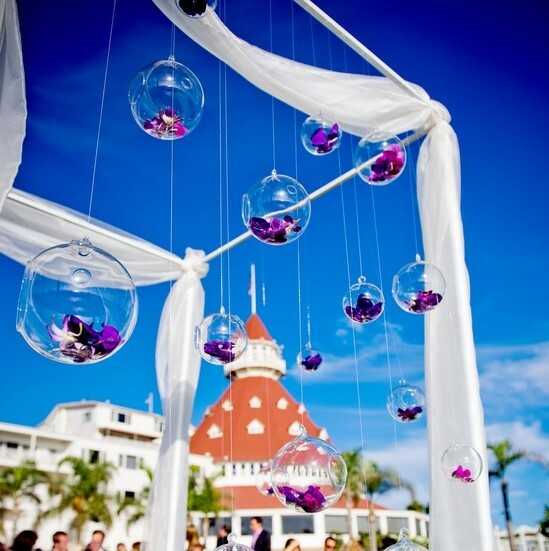 Glass globe terrariums filled with cut flowers can add to special event decor. Image from Isari Flower Studio. Glass terrariums are flexible decorating pieces, useful for both short-term and long-term projects. Imagine the fun of a holiday party punctuated with themed terrariums sitting around a decorated buffet table or how a single, planted terrarium would brighten your office. 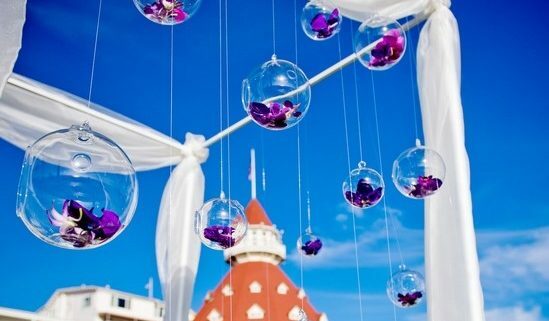 Even outdoor weddings are enhanced by glass terrariums with floating candles when they’re strung as a background to the bride and groom. People are making some cool things out of glass terrariums for their everyday lives, too. 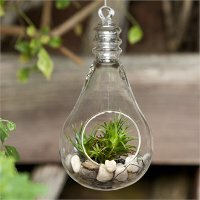 A plain light fixture with a wire frame can be upcycled into a unique, personalized chandelier with the addition of about 10 small terrariums hung at varying lengths all around the light. The same concept, applied to a grid structure, creates an interesting piece to hang over your dining table, kitchen island or in the middle of a living room. You can take the concept further and create curtains from dozens of floating glass terrariums hung from a horizontally-mounted wooden or metal support. Open floor plan homes are great for flexibility, but it can be difficult to differentiate between the spaces. A divider made from a floating glass terrarium curtain will allow you to feel like each space is clearly defined while leaving the brightness and openness of your home intact. Tabletop or wall-mounted tree branches make a great place to display just a few small hanging terrariums. You can even reuse old multiple pane windows by removing the glass and hanging terrariums inside each section and wall-mounting or hanging your creation from the ceiling. The design possibilities are endless with globe terrariums, whether you choose just one for a small project, or a whole case of assorted sizes and shapes for something much bigger. 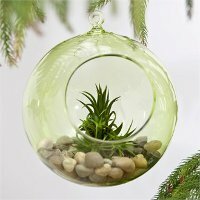 Check out the wide selection of ready-to-fill hanging terrariums available at Hooks & Lattice. 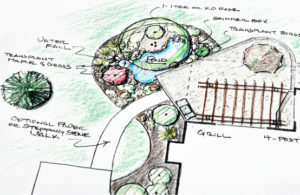 A landscape designer can transform your garden. 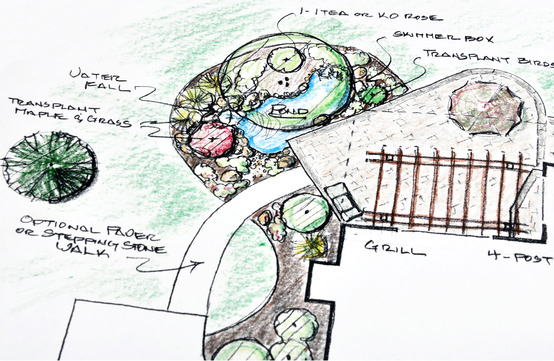 Finding the right landscape designer for your needs, however, can be challenging. Here are our tips for hiring a landscaper. 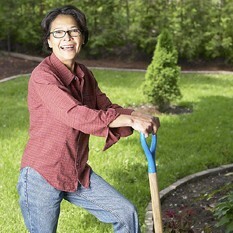 Check with Professional Landscaping Associations. Those landscapers who are true professionals will belong to local or regional professional associations. These groups maintain lists, often on their websites, of available landscapers in your area. Bonus points to landscapers who belong to more than one of these associations. One example is the Association of Professional Landscape Designers, which has local chapters in many states and regions. Ask Around. Your friends, family and coworkers are often the best source of leads for professional services. They’ve already been through the process of hiring a landscaper and will happily share their experiences, both good and bad. Even if they can’t give you the name of someone that is available to work on your property, they can certainly tell you who not to hire, and that’s half the battle. Check the Web. Many people today hire professionals from referral services like Angie’s List or Yelp. These types of websites allow people who have hired a contractor to leave feedback so that others will know about the level of service the landscaper provides. A great landscaper will be your partner in creating a beautiful garden. Now that you know how to find a good landscaper for your property, you should compile a list of questions to ask each landscaper you interview. (You weren’t thinking about hiring the first person that answered the phone, were you?) Aside from establishing pricing and availability, you need to know that the person you’re hiring is properly licensed and that they have the right equipment to perform the work your landscape demands. Licenses and Certifications: Not all landscapers are created equally – hiring a landscaper means asking probing questions of the person or company you’re interviewing. Many municipalities and states require licensing for selling plants to customers or applying pesticides, for example. Other laws may govern who can use certain titles, based on licensing or certification. It’s good to know that your soon-to-be landscaper can legally perform the tasks your landscape requires long before you bother with pricing. Professional Services: Some landscapers specialize in specific areas of plant or grounds care, such as organic pest management or tree health. Make sure that your potential landscaper is not only able, but willing and knowledgeable in areas that are vital to your job or has someone available with this skill set. You don’t want to be the customer that even the best landscaper uses to learn a new technique. References: Even though you’ve checked online and asked friends and family members about the landscapers that you are seriously considering, it’s good to ask the landscaper for references. If they can demonstrate a long history of satisfied customers, it’s a good bet that you’re going to be happy with the services they have to offer. Get It In Writing! No matter how big or small your needs, your landscaper should be a professional that is able to clearly communicate information and understand what you wish to accomplish. Make sure to get a contract that outlines payment terms, including milestone payments, as well as the estimated completion window and any warranties or long-term care agreements. This will protect both you and your landscaper, should a disagreement arise later. You always know a good professional by the tools he or she uses. If you love our products, direct your landscaper to HooksAndLattice.com for a wide selection of planters, window boxes, garden decorations, and more. Starting seeds indoors is a great way to get a jump on spring gardening. Need to beat cabin fever while snow still clings to the windowsills and frost hangs heavy in the air? There’s no better way to do it than coaxing a pack of seeds into germinating indoors. Starting plants indoors may be one of the best things you can do for your garden. Not only does seed starting allow you to choose from a much wider range of plants, but you will also know that your mature plants are healthy since you raised them from wee little seedlings. What Materials Do You Need to Start Seeds Indoors? Veteran gardeners know the secrets of starting seeds indoors, but if you’re at the beginning of your gardening adventure, you probably have a lot of questions. Knowing how to start seeds indoors saves the sometimes considerable costs associated with using transplants for annual flower, herb or vegetable gardens year after year. 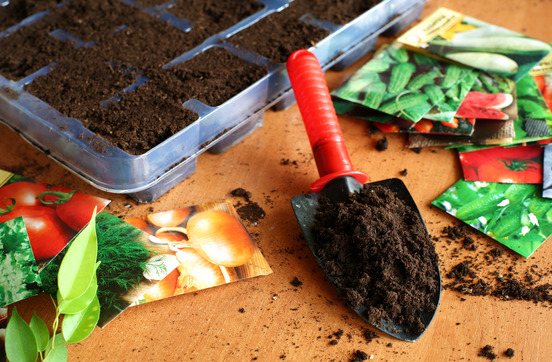 With your shiny, new seed packets in hand, you should go about collecting the necessary supplies for seed starting. Many gardeners use inexpensive, prefabricated tabletop greenhouse kits for starting their seeds. These units are available at home improvement stores and through garden catalogs. These miniature greenhouses provide casual gardeners with almost everything they need to start a few plants with very little experience. They generally come with compressed peat pellets with a dimple in the center to place your seed. As you water them, they expand impressively to form net-wrapped wads of growing medium, which are easy to transplant when the time comes. Gardeners who start many seedlings year after year may find these units limiting, though. 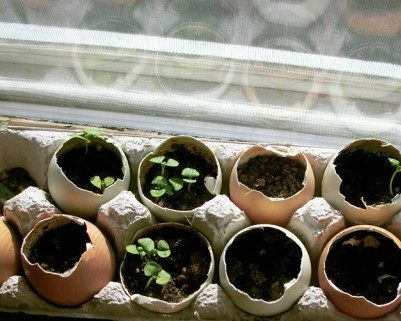 For a DIY option, you can make your own biodegradable pots from newspaper, fill them with a peat-based seed starting medium, and put them into large clear plastic sweater boxes. 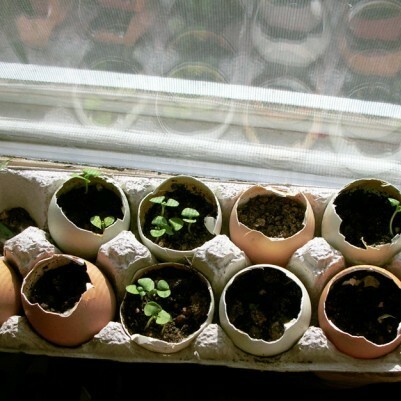 Some home gardeners use an egg carton and put the soil and seeds inside cracked eggshells. You can also simply sow the seeds directly in a window box liner or planter liner, which can easily be moved outside when the plants are ready. No matter what you choose to start your seedlings in, you’ll need to add artificial fluorescent lighting, but a CFL bulb in a lamp may be enough for a few seeds. Every seed needs to be handled a little differently. Your seed packets will explain how deep to plant the seeds and if any special treatment is required prior to planting. Small seeds are generally just sprinkled across the top of pre-moistened seed starting mix, but bigger seeds, like watermelons or pumpkins, may benefit from deeper planting. There are some oddball seeds out there, but for the most part the bigger the seed, the deeper it needs to go. Before you poke them into their individual cells or pots, check your seeds carefully to ensure they’re clean and free of any fuzzy surface molds that might cause them to fail. Once you’ve given your seeds the all-clear, water them just enough to keep the growing medium from drying out, sit back and watch carefully for the new seedlings to emerge. Some seeds take longer than others to germinate, so be patient with your indoor seed starting. If they go more than about a week past their ideal germination window, though, it may be time to try again with fresh seeds. Sometimes seeds are just bad. Consider starting your seeds in window box liners. When they’re ready, just carry the liner outside to your flower boxes! When Should You Start Indoor Seeds? To get your planting time right, you’ll need to figure out the average last frost date for your region. Almanac.com has an overview of major U.S. cities, and Dave’s Garden lets you look it up by zip code. Determine when the danger of frost has passed and then count backwards to find the date for starting your seeds. The chart below shows the germination and transplant times for some common garden flowers, herbs, and vegetables. Specific information can be found on your seed packets, too. Plan the timing carefully, because you don’t want to put out seedlings that are too young to survive, nor do you want to move leggy transplants out to the garden. Starting seeds indoors can be incredibly rewarding, especially when your flowers, herbs or vegetables are destined for a durable, long lasting planter from Hooks & Lattice. As soon as those little plants pop their heads out from the soil, it’ll feel like spring has already sprung! Have you successfully started seeds indoors and transplanted them outside? Tell us about it in the comments!